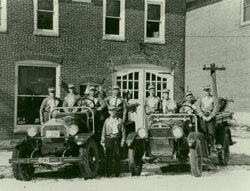 Back in 1927 the West Grove Fire Company was suffering from growing pains. They needed a permanent home to call their own, and they need to improve their apparatus to satisfy their rapidly growing territory. 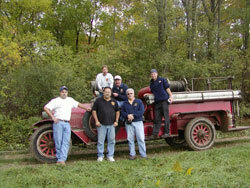 A truck committee was formed and this group decided to purchase a Hale pump truck. Pumpers were a new and expensive way to move water back then. Our previous apparatus had been chemical wagons (these mixed two chemicals together to form a pressurized stream for fire fighting). The Hale unit was selected by West Grove because of its relatively inexpensive price tag. While $4300 sounds low to us today, with the average pumper costing $425,000, it was still a big number for a fledgling rural fire company. The unit would have a 500 GPM rotary gear pump and one hose reel. Our order was placed in October of 1927. Hale was really a pump manufacturer. In their early days they mounted these pumps in trucks to boost sales and offer a "complete" package. To that end they spent most of their engineering dollars on the pumps, not the trucks. Most units were assembled from parts they could readily buy. Chassis's might be from REO, Mack or Autocar (all local builders). Engines could be a Waukesha or Continental. 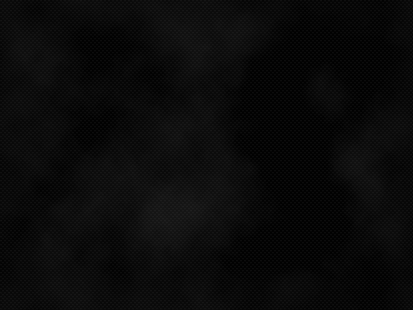 Many other smaller components would simply be from the lowest cost vendor at the time. Rarely will you find two Hale units that are identical. 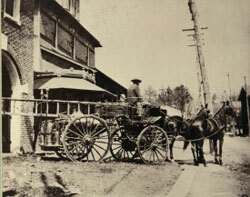 So, in late February 1928, our new Hale pumper was delivered to West Grove. She must have been a sight to see in our little town. Twenty two feet of bright red paint and shinny silver trim. The engine was a 736 cubic inch continental engine. A dual ignition (a magneto and a distributor) system was installed due to the unreliability of the new fangled distributors. A four speed manual transmission (actually everything had manual transmissions then). The pump was equipped with the new "pressure governor" option. What was the biggest thing missing? The cab! If you look at the pictures, this truck had no windshield, no doors, and no roof and most notably on cold winter days, no heat! The Hale was our first-out piece for years. It saw service on some of our largest fires. One older life member remembers it making the trip to New London one cold winter morning for a house fire back in the 1940's. It must have been brutal driving out State Road with no windshield! Over the years, West Grove did a few modifications to the truck. We changed the ladder rack to hold bigger ladders, flashing red emergency lights and quick couplers on the pump outlets. With the arrival of our new Mack pumper in 1954, our little firehouse on Walnut Avenue was overfilled, so the Hale was sold to a private collector for the grand sum of $150. She stayed around our area for several years, with sightings in parades and community events. During preparations for our 100th Anniversary in 2005, a few fire company members were dreaming of finding one of our older trucks. Most of us felt that we should be able to find our 1954 Mack, but the trail had already gone cold. Hope picked up when rumors of our first ladder truck surfaced. They dropped to new lows when we saw what the new owner had done to her. The truck had been cut up and made a race car hauler! We had pretty much put the thoughts of old equipment off because we were all busy preparing our newest trucks and both firehouses for the big 100th Anniversary Party. That is until the first Wednesday of October in 2005 at our regular monthly meeting. Chief John Chambers let us know that he had received a call from a woman in Tioga county PA who said she had our Hale. She was looking to sell it since the death of her husband, and thought we might be interested! The company voted immediately and unanimously to find out if this was our truck and, if so, get her back. One of our firefighters, Danny O'Connell, was attending college in Williamsport PA. Danny was asked to travel to Elkland PA to meet Mrs. Thorpe and take pictures of the engine. Lighting was poor but Dan was able to get a picture of the data plate with the serial numbers engraved on it. Hale corporation was able to trace these numbers back to the original bill of sale and pump test, to the West Grove Fire Company. After all these years, our truck found us, not the other way around, like we expected. It was obvious she wanted to come home. So, on a Saturday morning in early November, John Chambers, Bill Wohl, Lawrence Coppock, Matt Wood, Danny O'Connell and Mike Predmore set out to bring the Truck home. Following us upcountry was a tractor trailer tilt bed to haul her back. Most of the group was eager to get there, but the Chief never broke the speed limit! We met Mrs. Thorpe at the first gate on her farm. This gate was about a half mile back off the paved road. After we pulled through the gate and all introduced ourselves, she locked the gate. We then traveled about another mile in on the dirt and gravel road to a second gate. After passing through this gate she locked that one too! After a half mile We came to her house and barn. As the barn door opened we saw the truck tucked way back in the back, covered with dust and dirt and the remnants of years of roosting birds. To a normal person she must have looked pretty bad, but to the six of us, you might have thought we were staring at a brand new Ferrari. Our first thoughts were, how are we going to get her back to the paved road and the tilt bed? While a few of the team pondered this issue, I went to work to see if she would run. I know Matt was tired of cranking that huge motor after just a few minutes. I had come prepared with tools, jumper cables, gas, water and ether. After about a half hour of fixing wires, fueling her up and half of a can of ether, I told everyone to look out! We were driving her out of the Barn. Several experienced firefighter sought shelter when they saw how much ether I used, but when I jumped the starter, she cranked over a couple of times and fired to life! Matt and I jumped onto the plywood that was being used as a seat at the time. After a minute or two of making sure we knew where all the controls were, she rolled out under her own power. There was no shortage of blue smoke. Matt quickly learned that the tall metal rod in the center of the floor boards was a hand brake (it came in very useful on a couple of occasions). We drove her back the farm lane almost to the inner gate when she started to overheat. Not wanting to destroy a 78 year old motor, we shut her down. Towing her with the squad proved to be a lot trickier that it looks (this is where Matt learned the value of the hand brake). Danny rode in the squad and video taped this Keystone Cops routine. I understand that all you really see and hear is Matt and I smiling and laughing uncontrollably. The chief did a great job keeping the squad just out of the way. Back at the road, we took the time to load her up on the truck and talk to Mrs. Thorpe. She was sad to see her late husbands' truck go, but knew we would love the truck as much as he did. The six of us took the time to personally thank Mrs. Thorpe, and the group presented her a plaque from the Fire Company. As we left the farm, on the way back to West Grove, someone in the squad said that we should name the truck in honor of Mrs. Thorpe. The name seemed to fit like glove, everyone agreed. And Elsie came home.